I have recently been volunteering at LHSA to gain improved experience of cataloguing processes, and have been lucky enough to be given the responsibility of cataloguing the papers of Nancy MacLeod Nicol, which were gifted to LHSA following Nancy’s death in 2009. Nancy had a long career in nursing and nursing education, predominantly based in and around Edinburgh. She started her career as a student nurse at the Princess Margaret Rose Orthopaedic Hospital, Edinburgh, in 1956, and, following roles in various institutions, Nancy retired in 1994 from her role as Head of the Continuing Learning Department at Lothian College of Nursing and Midwifery (later merged into Edinburgh Napier University). Clearly committed to nursing, Nancy documented the entire span of her long career by retaining documents, photographs and ephemera relating variously to her own experiences in nursing, to colleagues and patients, and to the institutions where she was employed. After Nancy moved into nursing education, she cultivated an interest in the history of nursing and midwifery education in the Lothian area. During 1992, Nancy embarked on research into the history of the Lothian College of Nursing and Midwifery, the roots of which lay in the many individual hospitals and groups in the Lothian area which once trained their own nurses and midwives. Nancy’s research particularly focused on the history of nursing and hospital badges, which hospitals often presented to nurses on completion of courses. Nancy’s aim was to locate a badge for each hospital in the Lothian area and to research the history of both the hospital and the badge. The collection includes individual photographs of each badge, along with manuscript material relating to the background of many of the badges. When the cataloguing is complete, this will provide a useful additional resource to be used alongside LHSA’s own collection of nursing and hospital badges. In 2010, LHSA became involved in a collaborative project with the Royal Infirmary of Edinburgh and Edinburgh College of Art called ‘Unsung Heroes’, which focused on the LHSA collection of nursing badges. Nancy’s research provides fascinating context to the work carried out during the ‘Unsung Heroes’ project, and is likely to include images of badges which are not currently held in the LHSA collection. By documenting her career progression over a period of almost forty years, Nancy’s legacy is the provision of a rich source of social history relating to the nursing profession during the latter half of the twentieth century. It has been a pleasure to organise these papers into a fascinating, enduring archive of a committed nursing career. In May we blogged about the start of this exciting project, which aims to create a database of all patients whose names appear in the REH casebooks. Just 6 weeks into the project and our two volunteers, Arturo and Sandy, who work for 1.5 days a week between them, have already added 449 entries! If you’d like to take part in this project, please take a look at our volunteer pages. An interesting item found recently inside a file of Struthers Collection case notes is an old-fashioned pen. The case notes in the file date from 1935 and have not been annotated since then, so it is assumed that the pen dates from around the same period and may have been used by the surgeon Mr Struthers himself. It is approximately 17cm long and is made of wood with a sharp steel tip. The pen has been removed from the case notes and added to our Objects collection. To write, the user would dip it in a bottle of ink and then the ink would run down a channel in the nib to the tip. Excess ink was put onto blotting paper until the pen was ready to use. The tapered shape of the wooden section is similar to that of a feather quill from which it derives. Writing was much more difficult using this type of pen than fountain and ball point pens and it is no wonder that sometimes the writing is smudged and difficult to read and blobs of ink are common on the pages of the case notes. Fountain pens were an expensive commodity during the 1930s, so for everyday communal use a simple pen such as this one would be used. Refillable cartridges for fountain pens were not available until the 1950s. Ball point pens, although invented during the 19th century, weren’t widely used until the 1950s either. The ink formulation hadn’t been perfected – if the ink is too thin it runs out of the pen and if it is too thick it clogs the ball. 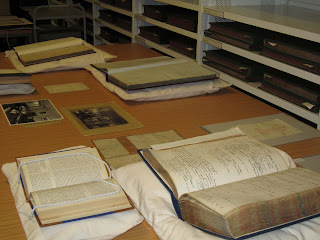 There have been a number of opportunities for LHSA to put material on display recently. 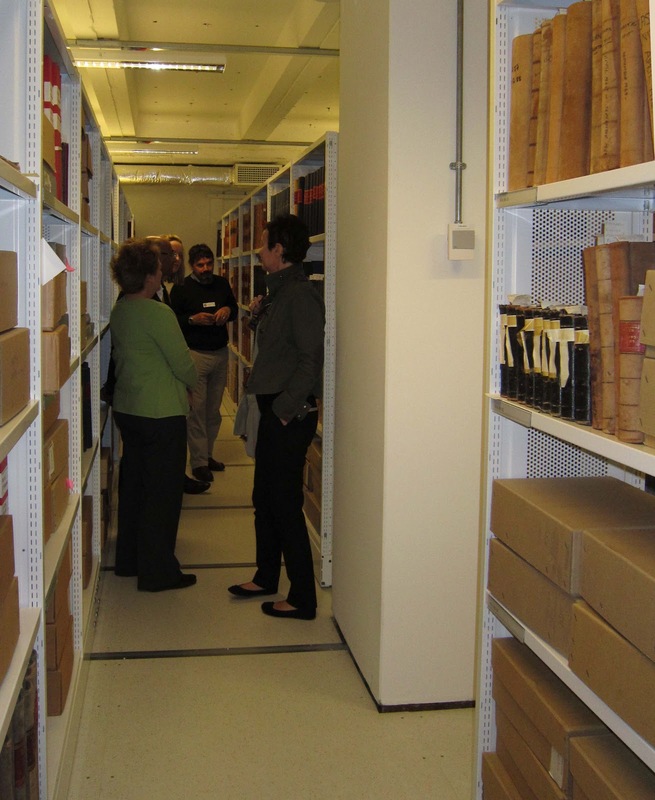 This week’s blog gives a brief overview of our work in this area, as well as highlighting several chances for you to see our collection items (some original, some in facsimile) out and about! Two of our Andrew Kennedy drawings are included in ‘Masterpieces II’, a fascinating exhibition in Edinburgh University Main Library (30 George Square, EH8 9LJ), which showcases iconic items and asks the viewer to examine the qualities that make a masterpiece. Admission is free and the exhibition is open 10am – 5pm Monday to Saturday until 30 June 2012. Over the last two days we’ve offered tours to NHS Lothian members of staff to introduce them to the range and depth of records we hold in relation to the hospital or specialism they work in. Yesterday we showed 15 dermatologists an accession we transferred from their department earlier in the year, now cleaned and rehoused, ready for future research use. And today it’s been the turn of staff working in the Royal Edinburgh Hospital, who had a particular interest in seeing the material we hold relating to the Hospital's history, and in looking at what items might be used to commemorate the bicentenary of this important institution. We’ve also provided digital images of collection items for exhibitions that other organisations have put together. A visually striking graphic from our UNESCO-awarded HIV/AIDS collections features in the ‘Human Race’ exhibition, which is touring Scotland and is currently in Inverness until 7 July and comes to Edinburgh’s City Art Centre and Royal Commonwealth Pool on 21 July (http://www.humanrace.org.uk/); and images relating to healthcare at the inception of the NHS are on display in ‘Delivering your community health services - from the birth of the NHS to 21st century primary care’, at The Heritage Centre, Manse Street, Saltcoats running until 29 June. We hope you’ll take the chance to see some of our collection on display, and if there is other LHSA material that you’d like to view please don’t hesitate to get in touch on lhsa@ed.ac.uk.